If anywhere deserves the name ‘Rich Coast’, it would be Costa Rica. This tropical wonderland of jungle, waterfalls, and beaches is full of stunning natural beauty and brimming with wildlife. Roughly a quarter of the country is protected land, making it a true haven for nature lovers. There are so many natural sights it would be easy to start feeling overwhelmed. So, here are the 7 national parks I think you simply must visit in Costa Rica. One of Costa Rica’s most popular national parks, Arenal covers a huge area of jungle with eight of the 12 different habitats that define the country’s flora and fauna. Named after the striking cone-shaped Arenal Volcano, there are various hiking trails around what was, until recently, central America’s most active volcano. Arenal is also known for its hot springs, powered by the region’s geothermal activity. They are an incredible place to bathe, whether you want to relax during the day or gaze at the stars at night. To get really close to the jungle wildlife, canopy walkways are an excellent activity to try out. Most of Costa Rica’s 850 bird species have been spotted in the park. There’s also a chance to catch sight of spider monkeys crashing through the tree canopy, or sloths curled up sleeping among the branches. Tortuguero National Park takes its name from the sea turtles that still nest on its beaches each year. This is a stunning place to learn more about these adorable sea creatures, including the endangered green turtle. This incredible turtle lay their eggs in the 35 kilometres of protected sands from July to October. With no road access to the park, the only way to reach it is by boat or even light aircraft. I think this only adds to the sense of magical isolation. Arriving by air also gives you the chance to better understand the park’s unique geography. It’s made up of a tangled network of canals, lagoons, and waterways that can be explored more closely by boat or on foot. A paradise for Costa Rica’s wildlife, Tortuguero is home to a huge number of species. Predators include crocodiles and jaguar, while monkeys, butterflies, birds, and poison-dart frogs are all regularly spotted from boat trips and hiking trails too. It may be the smallest national park in Costa Rica, but Manuel Antonio National Park still offers some incredible natural landscapes and panoramas. The park is criss-crossed with hiking trails, taking in the beaches, rainforest, and rugged mountains of the area. Alternatively, you can wade out into the clean sparkling waters of the Pacific with a snorkel or scuba gear in hand to take in the extraordinary sights beneath the waves. Here you’ll find amazing coral reefs that teem with colourful fish. The beaches of Manuel Antonio National Park are also worth mentioning. Where else can you lie on pristine white sand to the sound of chattering monkeys, scarlet macaws, and exotically-beaked toucans? One of the most biodiverse places anywhere in Costa Rica, it is home to 109 mammals and 184 bird species! The largest of Costa Rica’s 20 national parks, Corcovado takes up almost half of the Osa Peninsula, in Costa Rica’s south. It is home to one of the last remaining sections of lowland tropical rainforest anywhere in the world, making Corcovado of global importance. To get the most out of your time in Corcovado, it is definitely best to make use of a professional guide, especially if you want to track some of the park’s most elusive inhabitants, including tapir, harpy eagles, jaguar, and manatees. Corcovado also offers visitors the chance to explore Drake Bay to the west, the Pacific Ocean to the south, and the Sweet Gulf (or Gulfo Dulce) to the east. The last is definitely one of Costa Rica’s hidden gems, being one of the only tropical fjords in the world! The province of Guanacaste in Costa Rica’s north is home to Rincon de la Vieja National Park. The park’s major attraction is the 1,915-metre-high volcano which shares the park’s name. The name translates as ‘old women’s nook’, and stems from the myth of a princess whose lover was hurled into the volcano’s crater by her father. The princess clung to the volcano to old age, developing healing powers, and as a result you’ll still find believers coming from across Costa Rica to try and cure themselves of various illnesses. Having last erupted less than a decade ago, the region is still rich with geothermal activity. Visitors can find geysers, hot springs, and mud baths around the volcano’s base, which can be reached by undertaking one of the seven fascinating guided hikes. This is also the best way to see some of the park’s small but equally spectacular waterfalls. Situated on Costa Rica’s beautiful Caribbean coastline, Cahuita National Park protects both land and sea, but is best known for its coral reefs. There’s amazing snorkelling during the dry season of mid-November to April with more than 500 different species of fish living on the reefs. There are also two old wooden-hulled shipwrecks to explore beneath the waves. You’ll be lucky if you find any pirate treasure, but the ship remains do include a number of original cannons. On land, like Costa Rica’s other national parks, there are a number of hiking trails taking in the best of what Cahuita has to offer. The trail that starts at the village of Cahuita and takes hikers to Puerto Vargas point is perhaps the best. The village is also a great place to visit to experience a mixture of cultures. You can find authentic local meals, alongside excellent European cuisine in restaurants that serve locals, expats, and visitors without difference. 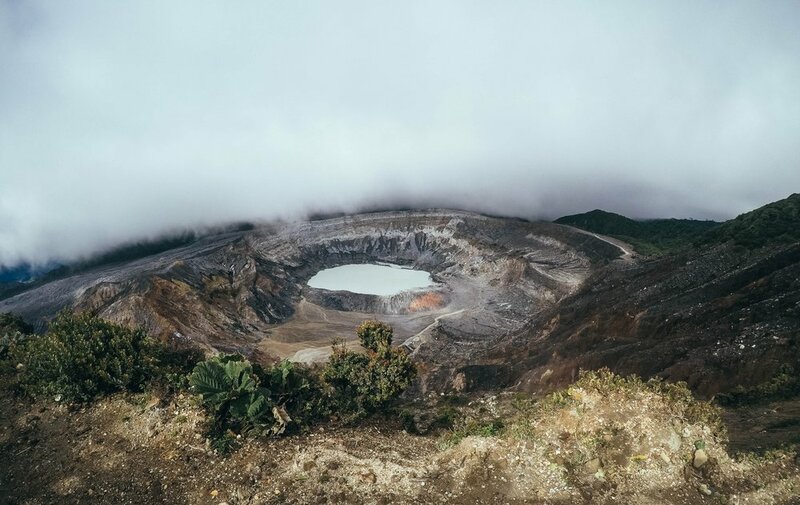 The star attraction of Poas Volcano National Park, in Costa Rica’s central province is undoubtedly the active volcano. In fact, the volcano is so active that the park was only recently opened to visitors after an emission of ash and rock damaged some nearby buildings in early 2017. As well as the natural marvel of Poas volcano itself, another popular park attraction is Lake Botos. Its clear waters sit in the extinct crater of another volcano, and can be reached along one of the park’s trails. Take one of the hiking trails through the cloud forest instead, and you’re almost guaranteed an encounter with hummingbirds, the clay-coloured robin (Costa Rica’s national bird), and the striking quetzal, all must-sees while in Costa Rica. Also, a super common question I get: What camera do I use for my travel photography? The main camera body is a Nikon D5600. With that I use the kit lens and a Sigma wide-angle lens, which I am genuinely obsessed with. Every travel photographer needs one to take your photos to the next level. Read on: My full list of travel gear, that I take on every trip can be found here.